Needle holders are available as accessories for use with 2mm and 4mm diameter needles. Some models are packed as an individual set in a box; boxes of 100 qty. These needles will clean the same materials as a pointed tip, but will leave light surface marking. Flat-tipped needles will reduce marking on metal surfaces and can give a polishing effect. For use on thin-gauge metals and any surface where a light treatment is required. 2mm needles used on a welded joint produce a similar effect to shot peening, reducing stress in the weld. Sharpened to a conical point, these are the most effective in breaking through very hard scale on materials where some surface indentation is permissible, or where a roughening or keying of the surface is desirable. 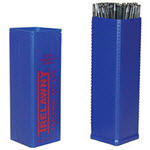 Available in 3mm flat tip only; for use in potentially hazardous areas. Available in 3mm flat-tip form only, to be used in applications such as refurbishment of food processing machinery or areas of high humidity where the corrosive effect on needles would be prohibitive. Used on decorative concrete surfaces where contamination of the surface from carbon steel needle is undesirable.